The popular N-series tractor line-up from Valtra has been updated, the latest N4 versions including many of the key features introduced on the larger T4 series models during 2014. David Williams reports. 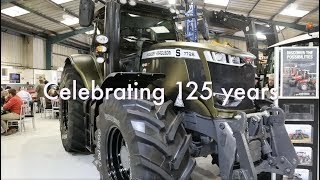 The 4-cylinder N-series has been a great success for Valtra since its introduction in 2005, with approximately 37,000 machines delivered of which some 3,000 are working in the UK. Valtra has always enjoyed a reputation for pushing the boundaries in terms of the power available from its tractors and the new N4 series upholds this tradition, with up to 185hp available from the flagship N174. New styling and a brand new cab are the most obvious features of the new models; the cab borrowed from the larger T4 series following a total redesign from scratch last year. The current N-series cab has been popular with users, but the larger cab with its clean and spacious layout offers many advantages including improved comfort. 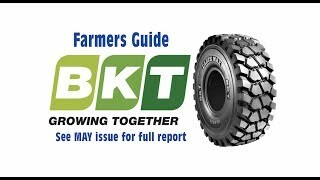 There are six models in the range, offering 105-165hp (rated) with an extra 10hp available in transport mode and an additional 20hp for the N174 for transport and PTO use. There are four variants; HiTech, Advance, Versu and Direct, offering different combinations of transmission and hydraulic specification. Power is provided by AgcoPower 4-cylinder engines, with 4.4-litres capacity for the N104, N114 and N174 models and 4.9-litre engines in the N134, N154 and N174 machines. All meet Tier 4 final emissions regulations, using just SCR (Adblue), so there is no need for a diesel particulate filter or exhaust gas recirculation, and Valtra claims its solution reduces fuel consumption and extends the engines’ working life. Common rail fuel injection aids fuel efficiency while an electronically controlled waste-gate on the turbocharger helps provide a flat torque curve. Valtra’s Sigma power control provides 10hp extra when the PTO is under sufficient load and at higher transport speeds on all models except the flagship N174 which gets an extra 20hp. Further economy is provided by the EcoPower models; N114 and N154, which have a selectable Eco operating mode, reducing engine speed by up to 20 per cent and fuel consumption by up to 10 per cent, compared to standard operating mode. A brand new development, likely to be a future option on other Valtra tractor series is Eco ASR, which offers wheel slip control, effective with both linkage mounted and trailed implements. Options include Powershift or CVT, HiTech, Active and Versu variants all equipped with 30-speed power shift through four ranges, while the Direct model has CVT. A new function, introduced on the T4-series tractors, is automatic shifting of gears on power shift models, ensuring the tractor operates at maximum efficiency and demands on the driver are reduced, while Hill-hold makes it easy to move away from standstill on slopes. The new N4 tractors share these features, both of which will be popular. Transmissions provide 40 or 50kph transport speeds with 50kph standard on the CVT models. The wheelbase is 2,665mm and the N4 models are very manoeuvrable with a turning circle of just 4.5m. Tyres up to 710mm width 0can be accommodated and there is a new hydraulic actuated front suspension system, which can be locked out for loader work. Ground clearance, depending on tyre size, is up to 55cms. Active, Versu and Direct models all have load-sensing hydraulics with flow options of 115, 160 or 200 litres/min. The base HiTech variant uses a gear pump with 73 or 90 litres/min flow rate available. HiTech and Active models have mechanical hydraulics, often preferred by livestock and smaller mixed farms while the higher specification Versu and Direct machines use electronic control for greater efficiency and can be equipped with up to seven hydraulic couplers at the rear with up to four at the front. Separate oil reservoirs are used for hydraulics and transmission on all except HiTech models. Hydraulic assistant is standard. This is another feature introduced on T4 models which speeds up hydraulic operations such as loader work while providing fuel savings as the hydraulic system supplies oil flows to match demand, speeding up the engine when necessary, for example when loader controls are moved to their maximum position. The rear hitch capacity is up to 8t, on N134, N154E and N174 models, courtesy of new hitch geometry and the optional front hitch has a capacity of 3.5t across the range. The PTO offers three speeds as standard with ground speed an option. The new N-series has a cab almost identical to that of the larger T-series, updated last year, and offers superb visibility all around courtesy of up to 6.5m2 of glass. Heated front and rear screens are an option along with a front wiper covering 270 degrees and a roof screen for improved visibility for loader work. The exhaust stack and air cleaner intakes are both restyled and are directly in line with the front cab quarter pillars, which makes them barely noticeable from the seat. One door is standard but two doors are available as an option, providing greater efficiency for those frequently entering and exiting the cab. Noise levels are impressively low at under 70db and there is a wide range of options available to provide additional comfort. An air suspension system is a new option, offering a further upgrade from the mechanical spring arrangement used previously. TwinTrac reverse drive is a further option allowing the operator to rotate the seat to face the rear, for reverse drive operations, providing greater efficiency for tasks such as grass mowing. A new option is a SkyView forest cab, designed primarily for forestry users with a large polycarbonate window, complete with wiper, in the rear section of the roof. AutoGuide automatic steering is available as an option across the range, and telematics are also available, offering benefits such as remote diagnosis of problems. All Valtra N4 tractors delivered before the end of 2015 will be equipped with Valtra Smart remote diagnosis telematics accessible through the My Valtra owner gateway. A revolutionary new option is the Automatic Slip Regulator (ASR). This allows the operator to regulate the amount of slip, and works by adjusting the engine and transmission together to control the amount of torque supplied to the wheels, so is especially effective for trailed implements where traditional linkage draft control isn’t available. By backing off engine speed and selecting a higher gear when wheel slip is high, wheel slip can be reduced and fuel savings can be achieved. The operator can select the ASR through five stages to suit the task being carried out. ASR is proving immediately successful and is likely to be standard on other Valtra tractor series, starting with the T4 models from 2016. Standard fuel tank capacity is 250 litres, but up to 315 litres is an option, allowing longer working days without needing to refuel. Adblue capacity is 45 litres, more than enough for 2-3 days’ work depending on the application. Valtra has reduced the service frequency for the new tractor compared to the current model, with intervals extended to 600 hours. The new Valtras require just five daily checks and with all the routine engine service points on the left-hand side, and transmission and hydraulic oil levels checked by sight glass, the tractor can be ready to work in just a few minutes. The UK press event, on a farm in Warwickshire, provided an opportunity to try out many of the key features of the new N4 models. Access to the new cab is excellent, with plenty of space for a tall operator to enter and exit. The control layout is very logical and the dashboard is clear and easy to read. Noise levels are low, enabling easy conversation in the cab even with the engine speeds well up. The power shift transmission changes smoothly when in auto mode, allowing the operator to concentrate on the implement and work area. Some steep slopes provided a good test of the new hill-hold feature, which required the operator to stop the tractor on the incline, put a foot on the brake and then move the shift lever to park and back to forward again. With the brake pedal released, the tractor remained stationary on the slope, moving away as soon as the accelerator pedal was depressed. One of the demonstration machines was fitted with Valtra’s guidance and auto-steer system and this proved easy to use with minimal instruction required prior to the test-drive. The new N4-series tractors are great to drive, with a superb working environment provided by one of the latest cabs in the industry. No other production 4-cylinder tractor offers more power than the flagship N174 and for those looking for a very capable lightweight and maneuverable tractor for field tasks such as operating a power-harrow drill combination, there are several options in the latest Valtra range. Valtra’s Unlimited studio provides the opportunity to have a tractor produced to any possible specification, including some very specialist options. Providing extra versatility is an articulated chassis for N-series machines, with the fulcrum just in front of the cab. Further versatility is provided by the conventional steering front axle which, when used with the articulation, allows extreme maneuverability and improved efficiency for field operations including the ability to set the wheels to track for headland turns and a crab operating mode which means none of the four wheels track. Spreading the weight across a much wider working area is great for tasks such as drilling where constant consolidation across the width is a benefit. Driving the NX tractor around the test route allowed all the steering mode options to be explored. The articulated upgrade is priced at #12,500 and it offers significant advantages for tasks such as loader work, where the articulation provides a large degree of movement for lorry loading. Missing from Valtra’s T4 series line-up until now has been a base HiTech specification. HiTech models offer powershift transmission and mechanical hydraulics and are often the choice of livestock farms where the complexities and added cost of sophisticated electronic controls are not needed. The base standard specification doesn’t mean the owner is deprived of efficiency aids, however, and the tractors are equipped with automatic shifting of the transmission, hill-hold, auto-traction and hydraulics assistant. One option fitted was fast steer which provides the operator with 2-speed steering, allowing fewer turns lock-to-lock for low speed tasks such as loader work, and less reactive steering for higher speed transport tasks. T4 HiTech hydraulics are fed by a gear pump providing either 73 or 90 litres/min of oil flow whereas the other models in the series have load-sensing hydraulics offering up to 200 litres/min. Three of the Valtra UK team at the event (l-r) Valtra UK sales manager Mark Broom, sales support product specialist Jamie Warner and sales support manager for the UK and Ireland Alan Sanderson.